That's over 1% for every hour! A pretty sweet Daily Deal has just arisen on Steam: Ironclad Tactics for 50% off! 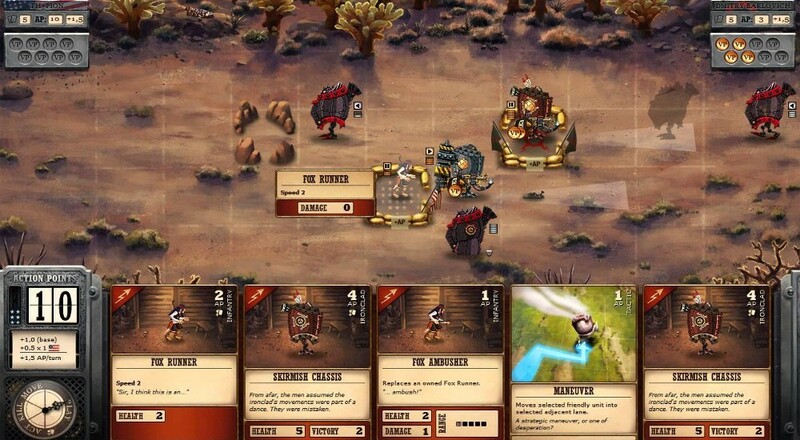 The card-based steampunk strategy game from Zachtronics has all the necessary ingredients for an awesome game, including a healthy level of difficulty, extra modes to challenge your head, an alternate American Civil War-era setting, and online co-op for two players. For the next 48 hours (less than 44 and counting. at the time of writing), Steam is offering Ironclad Tactics at half price. This includes the two pack as well as the Deluxe Edition, with the option to upgrade your standard copy to a better-than-standard one on the cheap as well. Deluxe Edition includes the first two add-on campaigns scheduled for release in the near future, digital goodies like an artbook, the soundtrack and a printable papercraft model, and giftable copies of SpaceChem. Our Ironclad Tactics co-op review thought the game was snazzy, providing a solid solo experience that's perfectly enhanced by the addition of a tactically-minded playing partner. It's much more accessible than Zachtronics' previous releases, which may or may not be attractive to some players, but either way it's great gaming, especially at 50% off.